Dolly Skincare for Grown Up Girls! 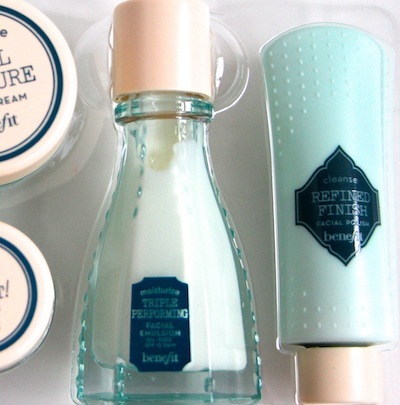 How utterly, utterly adorable is this mini skincare set from Benefit? The products look like the solid plastic ones that you’d get as a child in those “play at being a grown-up” sets! They are so brilliantly retro, I love everything about them. I’ve mentioned before that I’m a Packaging Pervert and this set just really tickles my fancy! I’ve never actually tried Benefit’s skincare range, so I have no idea what to expect from these. To be quite honest, I’m loathe to even open them up – I want to keep them forever preserved in their current state! You can find this six-piece starter kit on FeelUnique.com – it contains a cleanser, scrub, toner, eye cream, face cream and an SPF moisturising emulsion. 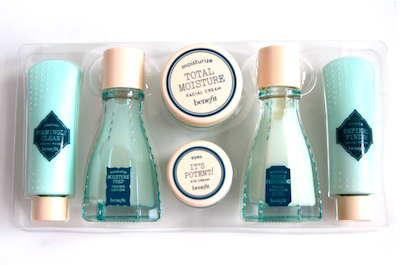 Pretty comprehensive selection and you get about 50ml of skincare in total, all for £10! This will be going into my Christmas Gift Guide as a stocking filler, but I couldn’t resist posting about it sooner. It’s Dolly Beauty for adults!